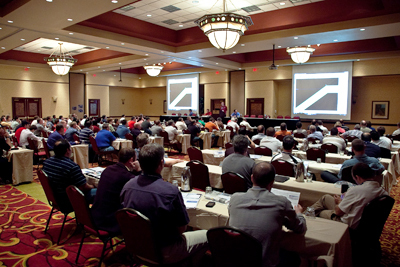 Location >> Corona, California By >> Quadrant Services Inc.
More than 150 SDS/2 users, Design Data representatives and industry partners attended this year's Users Group Conference, held October 21-22 in Lincoln, Nebraska. Attendees at the Users Group conference received a bound workshop overview book that included presentations and notes on each of the sessions. To view a PDF of the book, click here. The first day of the two-day conference was capped off by a banquet at Lincoln Station, located in the Haymarket area. The evening -- set to an Old West theme -- included a cocktail hour and dinner buffet, followed by the annual presentation of the Connector's Club award and a casino night. Design Data also raffled off several gifts throughout the evening. A frequent topic users bring up is that when changing loads on a member, the Change All option does not apply the updated loads to all other like members. This is intended to work this way. In versions previous to SDS/2 v7.114, the Change All feature would change the loads and all other options to match the member that was edited. The exception at the time was end elevations would only be changed by the same relative amount that the member being edited was changed. In a model there are four beams with a piecemark of B_76: two have a shear load of 15 kips, and two have a shear load of 25 kips. If one of these beams with a shear load of 15 kips is edited and a physical aspect is changed, such as a cope, and Yes is selected on the Change all window so all four beams are changed, this means all four beams would now have a shear load of 15 kips. The load was not changed, but because Yes was clicked on the Change All window, SDS/2 would change everything on all like members to match the one beam that was edited. Since v7.114, Change All was modified so that it does not affect certain options. When editing members, Change All should not affect Sequence, Toe direction, Beam rotation, Web rotation, Column rotation, Load settings, or Model complete date. Looking at the previously mentioned scenario with the four B_76 beams, if Yes were selected on the Change All window after changing a cope on one beam, the loads on the three other beams would not be affected. Design Data's SDS/2 Code Clash 2010 parametric competition debuted this year to highlight the creative minds of SDS/2 users and to promote the creation of parametrics within the SDS/2 community. Bruce Vaughan from BV Detailing & Design, Inc. was the winner in the Framing and Finishing category. 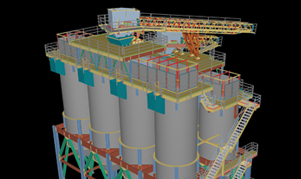 This category focuses on parametrics whose main purpose is to add members or material to an SDS/2 model. Steltec's Nicolas Deschenes won the Beyond the Bolts category. This category focuses on parametrics that do not add anything directly to an SDS/2 model, but instead do some type of auxiliary work, such as generating reports or some other kind of output that could be used with other software outside of SDS/2. Submittals for the Code Clash 2011 parametrics competition will open in the spring of 2011. Design Data's Doug Evans and Luis Torres of The Steel Detailers, Inc., presented the annual Connectors Club award during the Users Group Banquet, held October 21, 2010, during the Users Group Conference. The recipient for 2010 is Brian Cobb from Structural Detailing, LLC. 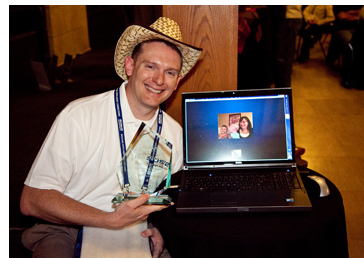 Brian's family viewed the award ceremony live via computer. 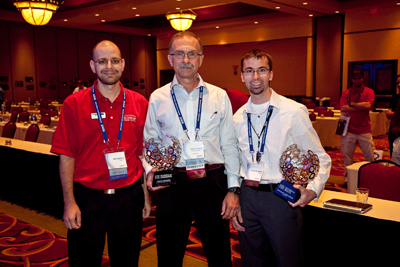 Winners of the 2010 SDS/2 Solid Steel Competition were announced during the SDS/2 Users Group Conference, held October 21-22 in Lincoln, Nebraska. More than 50 projects of varying size, type and complexity were submitted to this year's competition. They included such structures as a 50-story office building, a welcome gateway, a stadium, medical facilities and educational institutions. To see additional photos of the winning projects, click here. 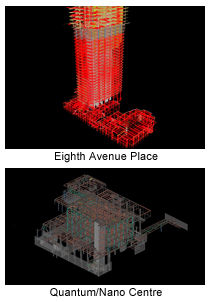 To see PDFs of all submitted projects, click here. Entries for the 2011 SDS/2 Solid Steel Competition will be accepted beginning in the spring 2011.